The Captain John F. S. Graziano Memorial Award and Scholarship has been established in his memory through the Daedalian Foundation by his friends, family and comrades in arms. 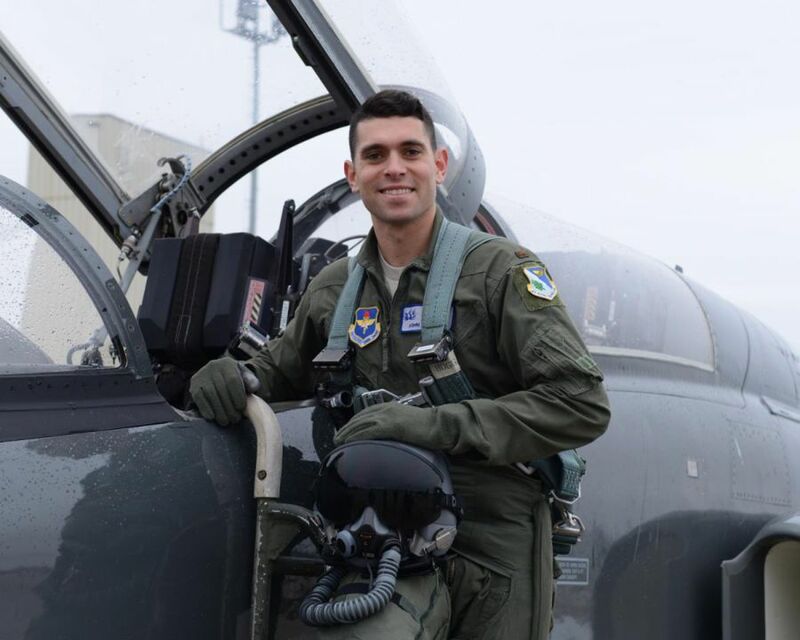 On November 13, 2018, Captain Graziano died when his plane crashed during a night training mission at Laughlin Air Force Base, Del Rio, Texas. Captain Graziano was a man of strong faith, integrity, and character. He did not fear death but rather embraced life, and celebrated each and every day with enthusiasm, warmth and a passion for flight. John treated others with kindness, respect, and compassion. In memory of Captain Graziano, a native of Elkridge, Maryland, the award will be presented to an exceptional pilot candidate at the University of Maryland’s AFROTC Detachment 330 where John earned his commission as an Air Force officer. John wanted to be a fighter pilot since the age of two, when he became fascinated with aircraft and flying while his father, Dr. Tom Graziano, served as a visiting professor at the Air Force Academy. Over the next couple of years, John learned to recognize the U.S. fighter jets and knew all about their flight characteristics, weaponry, and missions. He absorbed countless books and videos about military aircraft and impressed Academy cadets with his knowledge. Captain Graziano never wavered from his goal, always doing what was necessary and totally committed to working hard to realize his lifelong dream and goal. Becoming an Air Force pilot and officer was John’s calling in life. John’s passion for flying only grew as he advanced through school. He attended Our Lady of Perpetual Help in Ellicott City, Maryland, for elementary and middle school, and graduated from Archbishop Spalding High School, Severn, Maryland, in 2008. John was among the rare students who excelled simultaneously in both sports and academics, playing basketball and running cross country and track while achieving the highest grades to earn an ROTC scholarship in the engineering degree program at the University of Maryland, Baltimore County (UMBC). Also enrolled in Air Force ROTC Detachment 330 at the University of Maryland, College Park, John earned his Air Force officer commission and worked diligently to qualify for a pilot training slot, awarded during his junior year. John was well on his way to realize his dream of becoming an Air Force pilot. After graduation from UMBC with a Bachelor of Science in Mechanical Engineering in 2013, John began pilot training at Laughlin Air Force Base in Del Rio, Texas, in January 2014. While earning his wings, John received the “Top Elvis” Award after the T-6 phase of training. Already selected for T-38C training based on his superior flying abilities, this award was given by his flight commander based on traits outside of flying including leadership, work ethic, flight room presence, attitude, willingness to help, ability to accept instruction and officership. Upon graduating from Specialized Undergraduate Pilot Training in August 2015, John was selected as a First Assignment Instructor Pilot in the T-38C Talon, as part of the 87th Flying Training Squadron, 47th Operations Group, 47th Flying Training Wing, Laughlin Air Force Base, Texas. Captain Graziano was an accomplished and skilled Instructor Pilot, serving in many capacities at Laughlin. As a Check Pilot, John flew over 40 student pilot evaluations, critical to training validation of 122 pilots, the most produced in over a decade. As a T-38C Instructor, John flew 1,010 sorties, amassing 1,130 hours, contributing to the graduation of 306 pilots for the U.S. and seven allied nations, earning John the Air Education and Training Command’s “High Flier” award for 2017. This top award is hosted by 19th Air Force and recognized John’s dedicated and exceptional efforts to produce highly qualified aircrew. John was also Laughlin Air Force Base’s only T-38C First Assignment Instructor Pilot selected to be a Functional Check Flight Instructor Pilot. During his service as an instructor, he earned several further awards including Instructor Pilot of the Quarter, Company Grade Officer of the Quarter, and six Best Instructor Pilot awards from the students of graduating classes. Several weeks before the mishap, the Air Force assigned John to fly the F-16 beginning in 2019. Upon joining the Air Force and taking his place in the pilot community, John felt at home with the intense physical and intellectual demands of the military flying profession. Accordingly, the scholarship recipient should exemplify the same high standards that John demonstrated every day, both in and out of the cockpit.